All learning counts with the Summer Learning Challenge! Visit any CPL location to read, discover and create. We've added a few new friends to our Summer Learning Challenge this year—baby trout! 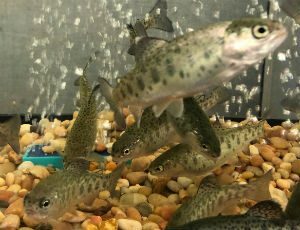 The Thomas Hughes Children's Library at Harold Washington Library Center and Brighton Park Branch each have a tank of baby trout to care for this summer. Visit our fish friends and watch them grow throughout the summer until they are released into Lake Michigan this fall. Trout, Trout, Trout! Shout it out as you learn about all types of fish native to the United States and Canada. Jangles is a whopper of a tale about the fish that always gets away. Choosing A Fish can be hard, but this book will give you all the information you need to care for a pet fish in your home. Don't have your own tank? Get a little creative and make your own fish art from found objects like in Rain Fish. And just for fun, follow a little trout-like fish through some deep, dark waters in This Is Not My Hat.